What if…Mike wasn’t dead tired as he was writing this? 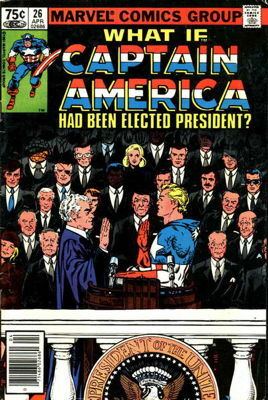 …a short gag back-up, or an “Untold Tales of the Marvel Universe” story, or…well, more content than what was promised on the covers. I’m generally familiar with the main stories for most of the issues, just from having seen the covers over and over and over again at whatever store I happened to be working at the time. 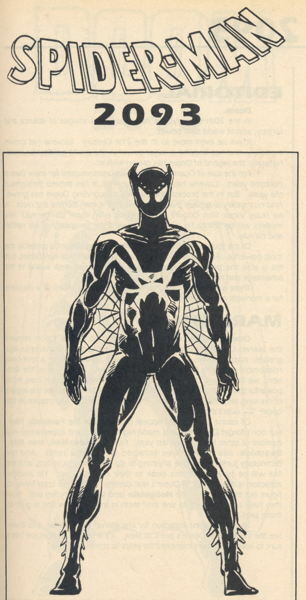 But the back-ups…unless it was an issue I’d actually purchased and read at the time, the supplementary material in What If…? are nearly always new to me. 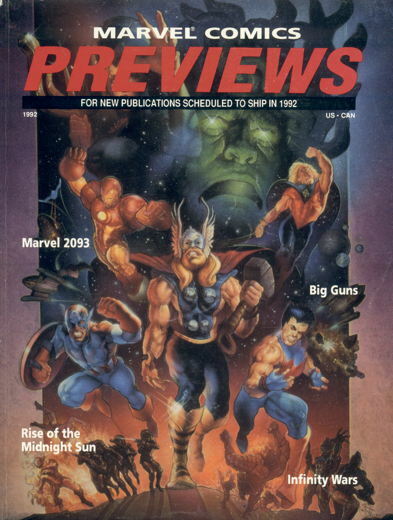 …and not a Man-Thing to be seen on that cover, alas. Of course, eventually the Internet would spring into being and never again would I ever have any trouble tracking down that exact bit of information I need, and I’d finally put an end to my half-hearted seeking of this issue. 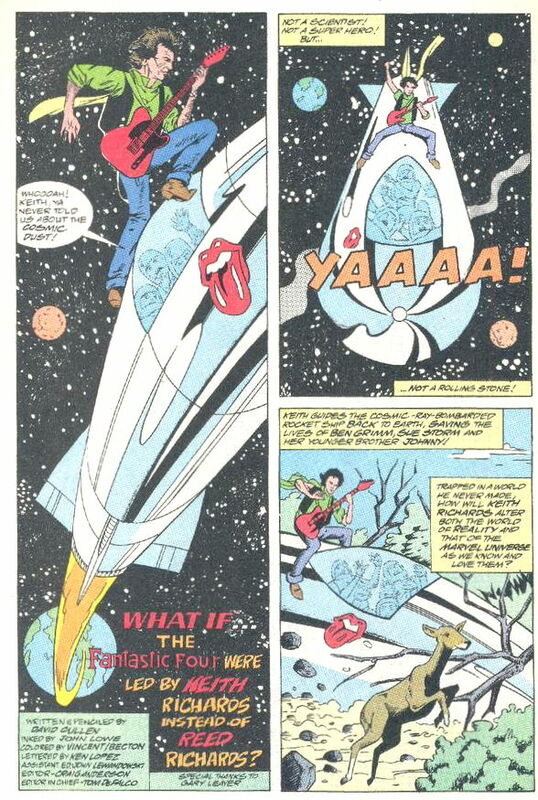 There are plenty more short and funny pieces located in those old What If…? 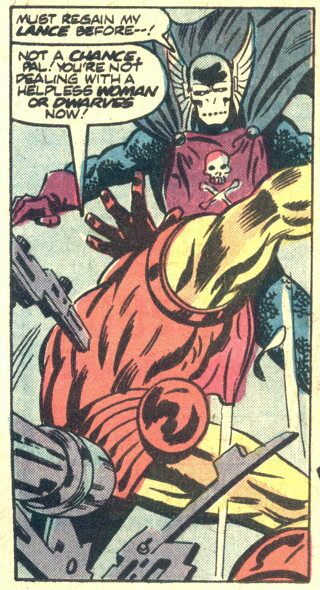 s, with issue #34 (of both the ’70s and ’80s/’90s runs) basically being an issue filled with those same shorts. Don’t know if they had space to spare in these new What If…? comics that are Coming Soon to a Shop Never You for gags like this, but it’d be nice. 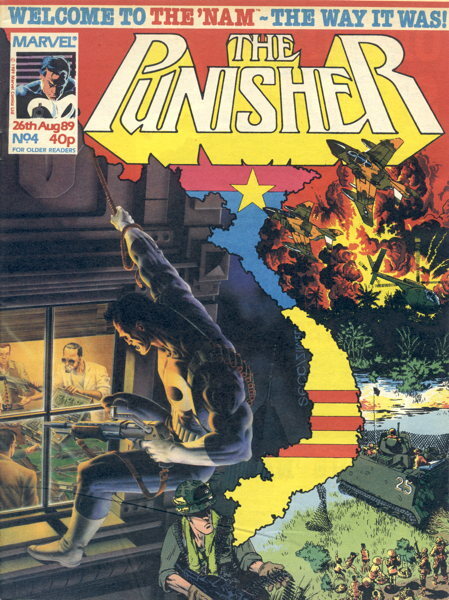 And now, for no particular reason, here is a cover for an issue of the Punisher magazine they published in England. 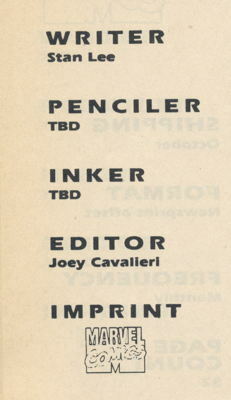 From 1989, reprinting in color issue #4 of the 1986 Punisher mini-series by Steven Grant, Mike Zeck and John Beatty. Also includes a black and white reprint of one of The ‘Nam comics by Doug Murray, Michael Golden and Armando Gil. Insert joke here about Stan Lee being some new guy they’re trying out on a start-up title rather than risking him on any established books. Well, sure, I loved Match Game: The Next Generation , AKA Match Game ’73 , and sure enough, the 2099 line (as it would later be called, when cooler heads prevailed and decided “2099” was exactly six years’ worth of awesome better than that piddling “2093”) did indeed do very well. At least until the entire comics market tanked shortly thereafter, but, you know, whaddaya gonna do? 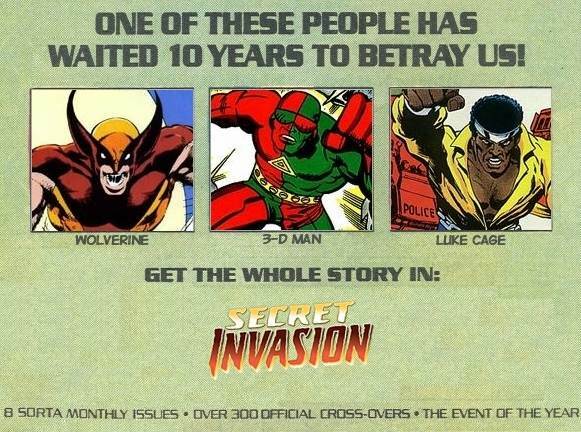 And just look at those creative teams! The text pieces for all the books describe them in the most general of terms, usually along the lines of “like the modern day Marvel heroes, only more future-y,” without any specifics like character names, settings, how exactly the characters are going to be different, etc. 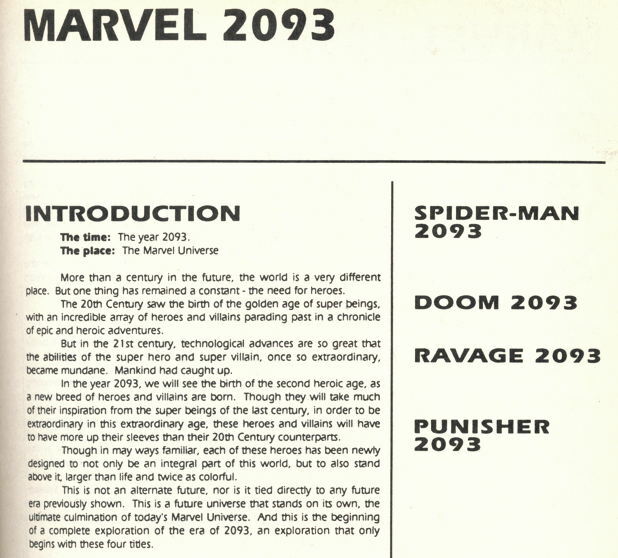 Well, the entry for Doom 2093 pushes the “is this really the Doom from the present-day Marvel Universe?” angle, so that hook at least was present this early in the development process. Probably the first and last time the sales success of the amazing Punisher Armory was used as a marketing tool for another book. I’m currently reading Marvel Comics: The Untold Story , Sean Howe’s tell-all book about the history of the company and the personalities therein. Reading a handful of excerpts here ‘n’ there, such as this one over at The Comics Journal , finally got me to pick it up, and it’s been fascinating reading. 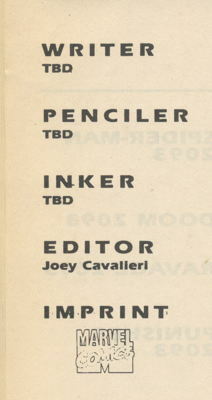 I’m only up to about the early ’70s in the narrative, and boy howdy there’s a lotta drugs involved, but I am really looking forward to the material that covers what was going on with the company during my time as a funnybook salesman, starting with the big industry boom in the late 1980s. Another comics-related-but-not-actually-comics thing I’ve been enjoying recently is season two of The Walking Dead , even though I’m not a reader of the comic it’s based on. Nothing against the comic, really, but I didn’t get into it early on, and suddenly there’s now seventeen trade paperbacks (or, alternatively, two huge omnibi) and I’m way behind, and I already read enough comics, and blah blah poor me life is hard. But the show is a lot of relatively-harrowing fun, and the zombies are suitably gross, and I like a lot of the actors. The show has yet to top the excellent series premiere, but the second season’s focus on the cast trying to make a home at the seemingly-safe farm, and its build-up to the apocalyptic season ending, made for some perfectly fine serialized horror storytelling. I prefer to think of it as the "Event of the Millennium." § April 3rd, 2008 § Filed under dc comics, marvel Comments Off on I prefer to think of it as the "Event of the Millennium."